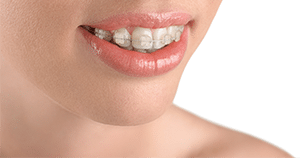 Clear braces they shift your teeth using the same technology as traditional metal braces but are far less noticeable than the silver coloured brackets. Consisting of tooth coloured brackets, clear braces utilise o-rings to hold the orthodontic wire in place to dramatically move your teeth, in a relatively short amount of time. How do I take care of my clear braces? Looking after your clear braces is the same as looking after your traditional braces. This includes brushing and rinsing your teeth after every meal and flossing correctly. When you brush and floss, ensure you have removed all the food particles to reduce the risk of tooth decay and disease. Your braces have small places for bacteria to thrive and multiply especially on the back molars. Be prepared however, taking care of your teeth involves a lot more effort when you’re undergoing orthodontic treatment. Cleaning your braces daily may seem like a big deal and a lot of effort, but the extra responsibility will have long lasting effects. The team at Northshore Dental and Oral Health can inform you on how to correctly care for your braces when you get them fitted and at each follow up appointment. Cost shouldn’t stop you from obtaining a straight smile. For all our services we offer a range of payment plans including zipMoney MediPlan, GE Finance and also an in-house payment plan. We also accept most major credit cards like MasterCard and Visa. We also have a HICAPS machine, so you can get your rebate back quickly, and easily. Do you want to start the journey to a beautifully straight smile? Contact the experienced team at Northshore Dental and Oral Health today.